Last weekend we painted the interior of our front door and I’m so happy with the result. Our little entryway was in major need of an update and this was perfect. I just love how the navy blue looks, our small entry area is so pulled together now! I’ve teamed up with Glidden for this quick and easy makeover and Glidden is offering a $50 Home Depot card to a lucky No. 2 Pencil reader, perfect for a mini makeover like this! 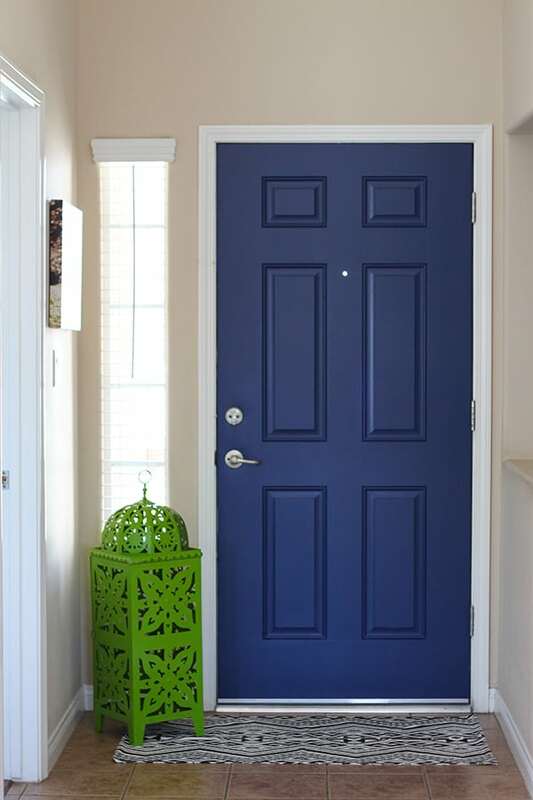 First, let’s take a closer look at this beautiful navy blue door! Nothing to see here, just a plain boring door that has started to look a little grubby around the edges. We taped off the edges of the door and the hardware and left it on the hinges. We used a roller for the flat areas and a brush for the corners. In about an hour, we had a brand new look! Glidden Duo is a combination of paint and primer, so we had great coverage in just two coats. I spruced it up with a small black and white rug that was on sale at Hobby Lobby and a green lantern that I purchased from Z Gallerie a few years ago. I LOVE the green and blue together. I also really love the idea of painting the interior of your front door. It just makes the entryway very special. It’s a great place to put a nice pop of color. Don’t be afraid to go bold. It’s a quick project that you can easily paint over! Just follow the rafflecopter prompts to enter the giveaway! Leave a comment to enter and for an extra entry, leave a review on Glidden’s site! Make sure you log into rafflecopter and click I commented or your entry won’t count! This post was created in partnership with Glidden. Sorry, open to U.S. readers only. $50 USD total value. Winner will be contacted via email. I want to paint my bedroom!! I need to repaint my hallway. I haven’t do it yet just trying to decide on the perfect color. This gift card would definitely speed of my decision process! I would get some hardware for the cabinets! The door looks great but it’s the accessories that are the cherry on top. That green lantern really makes both colors pop! Your door looks amazing! I would buy some drawer pulls and some paint. Thanks!!! 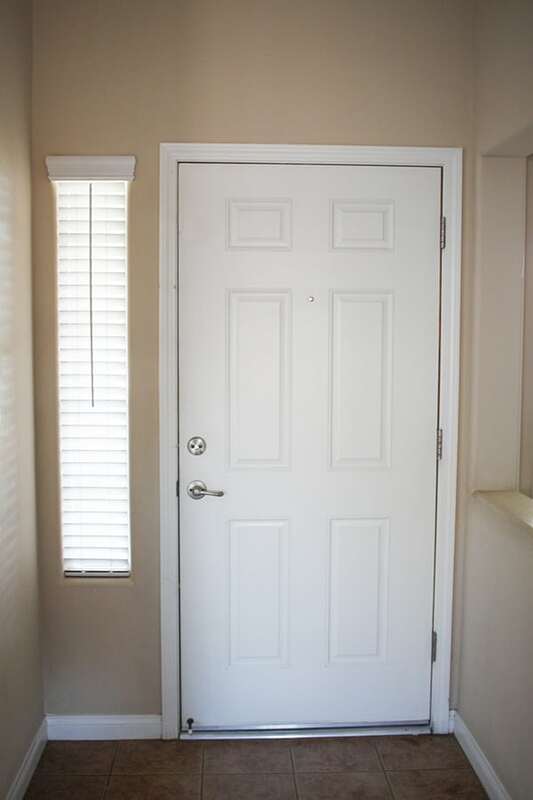 I would like to try painting the inside of my front door. Love the blue! Maybe I’ll paint my door next!! I need to repaint my living room. We still have the white walls from when we moved into our new house and that was in 2007!! I’ve been thinking about painting the inside of my front door. I love this color! Small changes yield big results, so pretty!! I would buy paint for my master bathroom! Thank you for the wonderful giveaway. Love your navy door what a difference in the wow factor. I’ve been wanting to paint my door for a while now. You gave that boost. Oh my – it turned out great!!!! We built our house about a year ago & it’s been one project after another to give it character beyond the builder grade standard we started with. So $50 at Home Depot would definitely go to more of those projects. I’d put it towards a new front door! I would paint my front door! How fun! well we’re in the middle of building a house – so i would buy paint, or light fixtures or ANYTHING really! we need it all! I would get a cool lamp for my desk. I would get new paint for the living room. I love your door! Now that it is cooling down enough to leave our front door open for a few hours, I want to darken the stain on the inside to flow with some other features and paint the outside of the door. We are re-doing a small 1950’s home, so we are regulars at Home Depot. I would spruce up my entryway as well. I have been wanting to paint the front door for some time now, and this would be the perfect excuse to finally do it! I would finally purchase the power hedge clippers I’ve been wanting for years! I would buy paint and new shower curtains for my bathrooms. I love the blue door!! Put it towards a generator! Paint my door! That is just a lovely color! What an easy project! 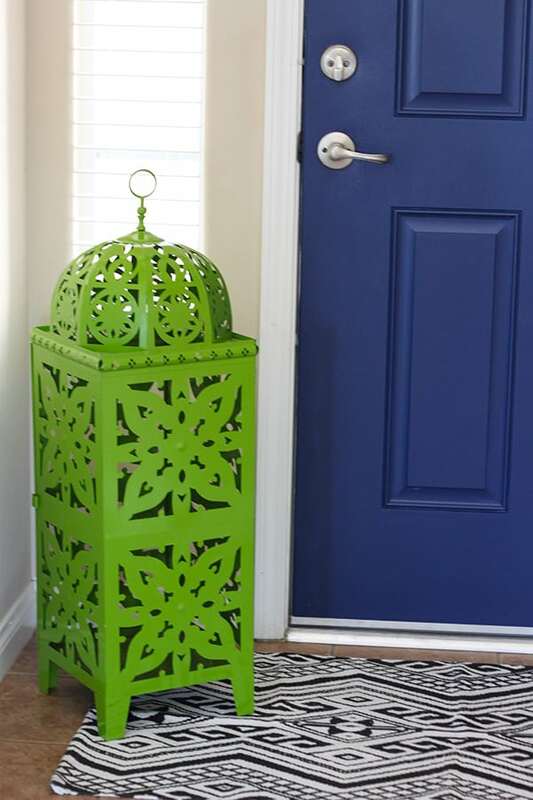 It’s definitely a quick way to match your interior and make your entryway pop! Thanks for sharing!